Our last publicity at the Sabah Trade Centre on 20th (a day before the Debut Concert) to boost up more sales in concert tickets. 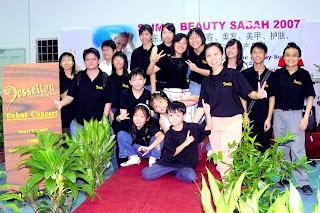 This is the first time Sabah has a Music Fair which was held together with the Slim & Beauty Fair. We were given a time slot of 2 hours (4-6pm) to present some solos and chamber music. Photo above are those who are involved. A big thank you to all of them for their effort.